Bashamichi is a street which was built to allow horse-drawn carriages used by foreigners who lived in the settlement to run through immediately after the opening of the Port of Yokohama. 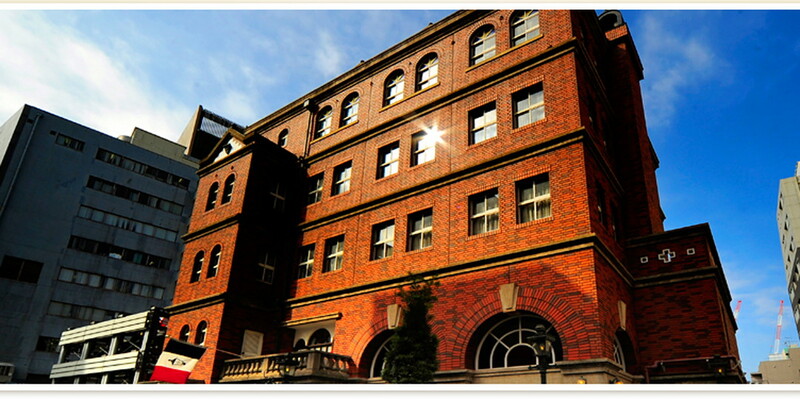 Since then, the history of the Bashamichi Street has exceeded 150 years. In such a long history, various episodes have been born. Now, let’s explore historical mysteries related to the Bashamichi Street. Rules behind open brick pavements. There are many symbolic things on the Bashamichi Street. The brick pavement is one of them. 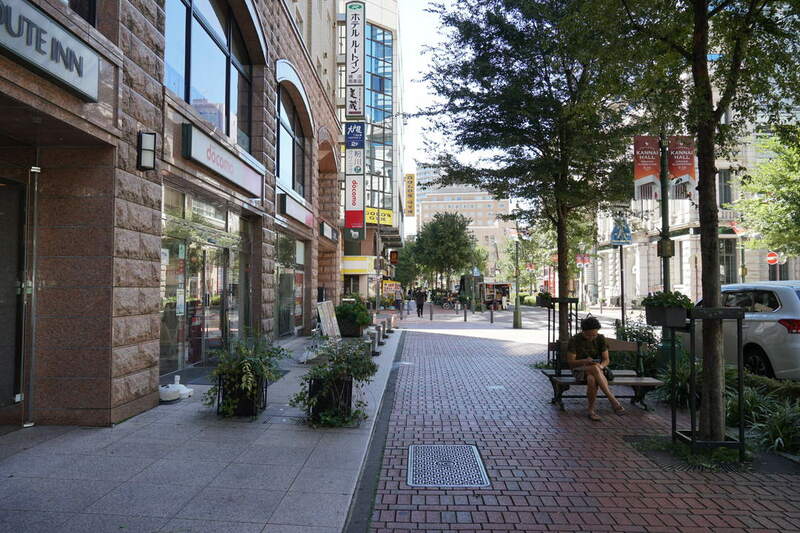 While walking around the Bashamichi Street, you would feel this pavement is very comfortable and open. As a matter of fact, this is because all buildings along the pavement have been set back a little. This has been done in accordance with “Bashamichi Development Agreement”formulated by Bashamichi Shopping Avenue under the philosophy of cherishing the culture and the history at the time of the opening of the Yokohama Port, and proposing new culture. In order to make the space for pedestrians in this area safer and more comfortable, it has been stipulated that the first and the second floors of the buildings are set back several meters from the pavement in this Agreement. 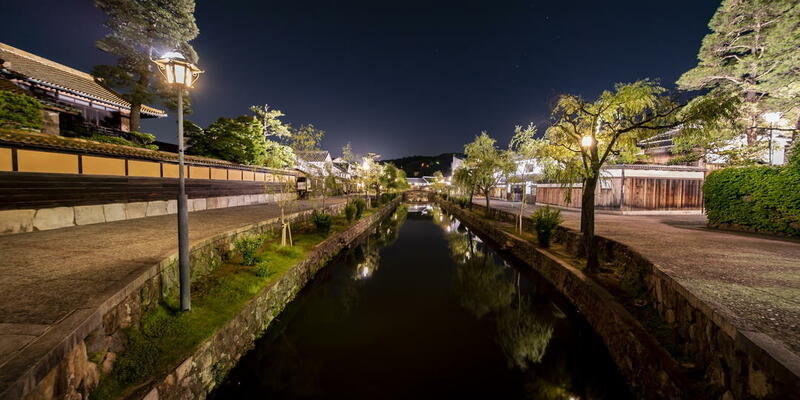 Besides, thoughtfulness to keep scenery and atmosphere harmonious in the entire Bashamichi Street is incorporated in the Agreement, for example, restraining height of buildings and making advertisements consistent. The open and spacious brick pavement is owed to those efforts. In the Bashamichi district, there are a lot of stores that have continued to operate since old times. 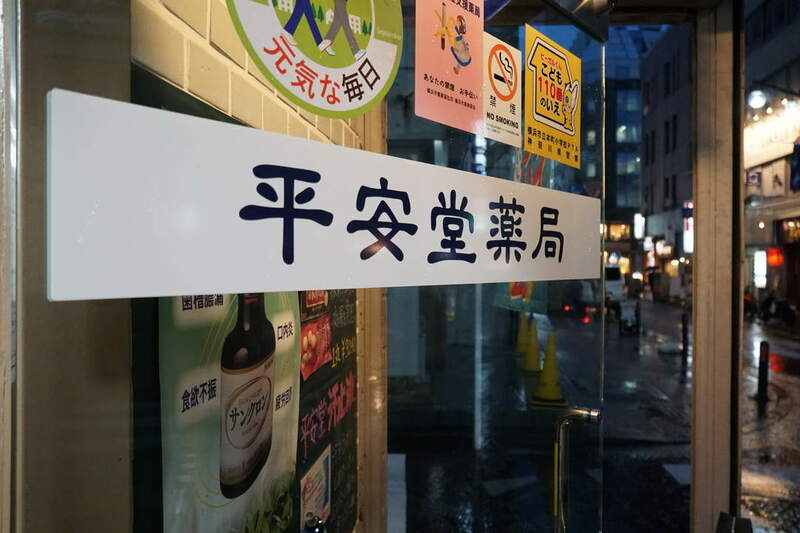 One of them is “Heiando Pharmacy” which has been in operation since the time the Bashamichi Street was built. 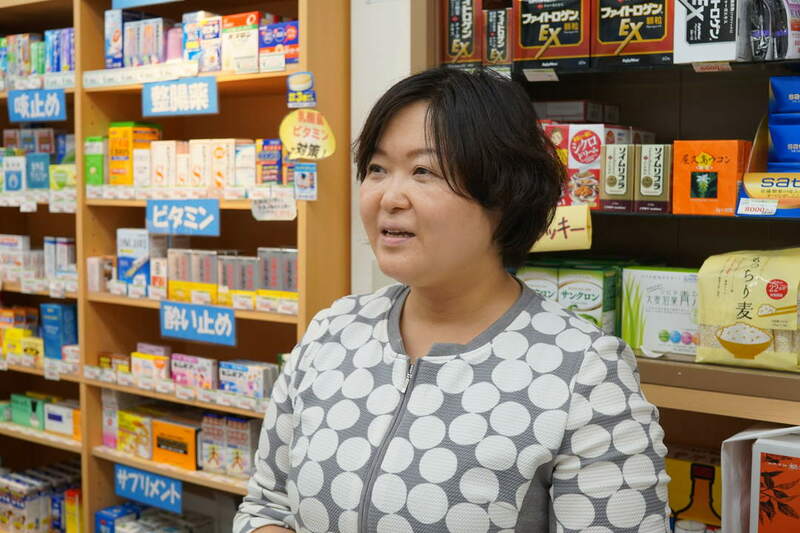 This long-established pharmacy was founded in 1870, and the present shop owner is Ms. Seiko Shimizu in the 6th generation. “Heiando” is famous for not only being old but also selling something unexpected. Surprisingly, it is ice cream. As known well, the Bashamichi district is also the site of producing and selling ice cream for the first time in Japan. Even though located there since old times, why is the pharmacy selling ice cream? According to Ms. Shimizu, this “Yokohama Bashamichi Ice Cream” had been originally sold by “Aioi”, a restaurant located across the street. 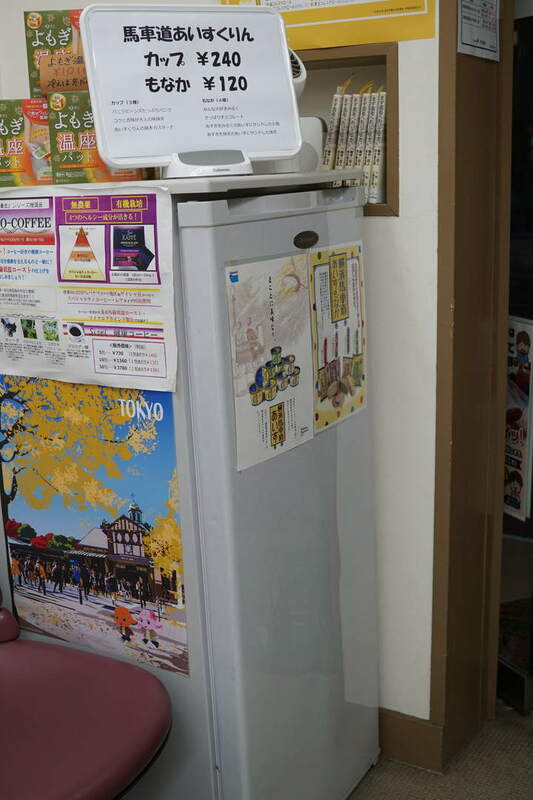 When going out of business in 2015, Aioi looked for a store to take over sales of the ice cream. Then, Heiando became a successor. Despite being a pharmacy, Mr. Totaro Shimizu, the third generation of Heiando, made and sold ice cream some 100 years ago. Also in the Showa era, the pharmacy was selling ice cream. Like this, it has been somehow involved in ice cream. 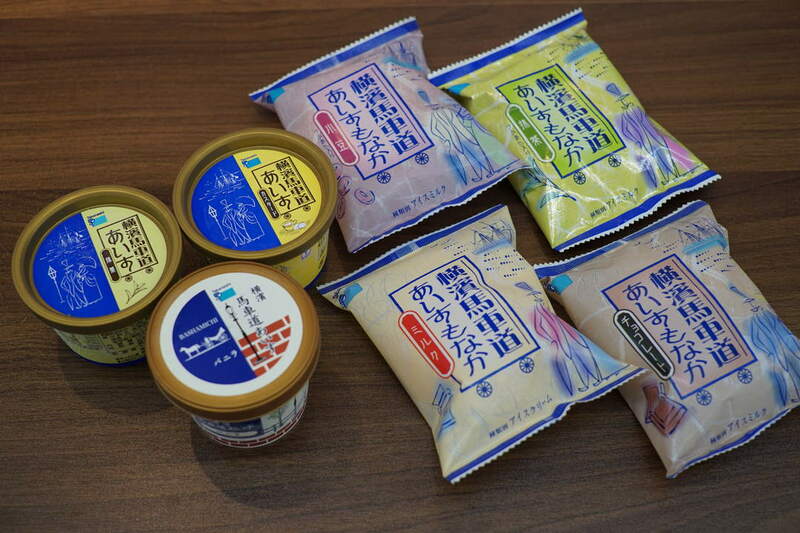 As with other native residents of the Bashamichi district who positively seek novelties while preserving the tradition, Ms. Shimizu started selling monaka ice cream that is easy to eat while walking, in addition to conventional ice cream in a cup. Because of its location, more adults buy it than children. Aged customers often drop by while taking a walk. Red and black exterior design. Polka-dotted film on the window. The appearance like a fashionable cafe. Some people may wonder what the shop is selling. As a matter of fact, it is a glasses shop. 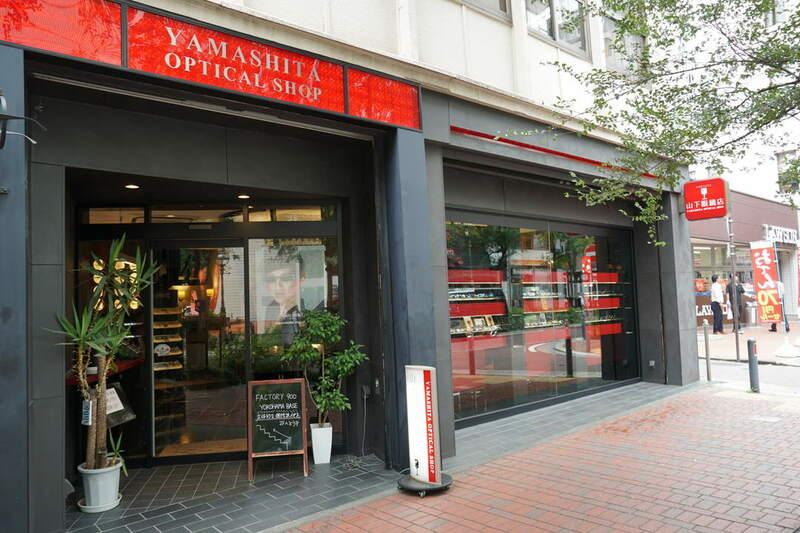 “Yamashita Optical Shop”, founded in 1957, was renewed drastically 11 years ago. Mr. Osamu Yamashita, the third-generation shop manager, took leadership in refurbishing the ordinary glasses shop drastically. He thoroughly changed the atmosphere of the shop, and differentiated the shop from mass retailers by announcing itself as a “glasses sommelier”. In addition, the shop has another distinctive feature. It carries a lot of glasses with unusual design. “Of course, functions of glasses are necessary. But, if you wear glasses, don’t you prefer to the glasses which would make you positive?” said Mr. Yamashita. 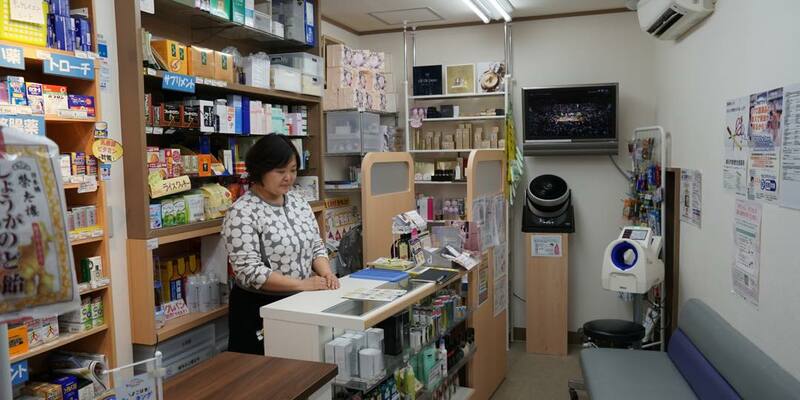 With the unique selection of items which you cannot find at the other shops, the number of fans has rapidly increased, and many TV programs have featured the shop. 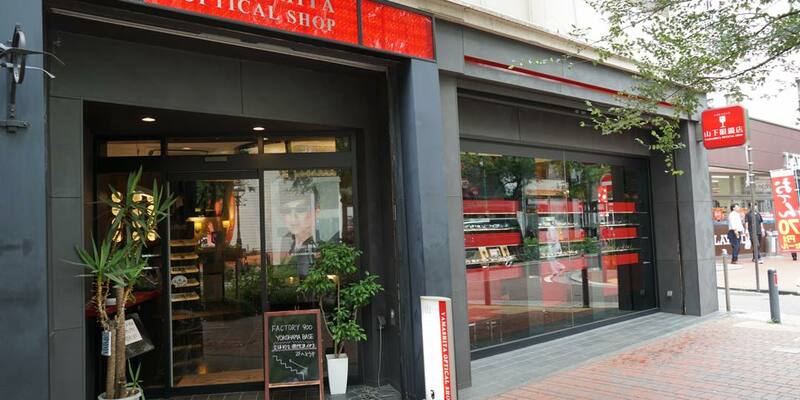 Allegedly, there are people who come to the shop from a distance by Shinkansen, and who purchased 190 pairs of glasses for eight years. “We didn’t intend to collect unusual glasses from the beginning,” Mr. Yamashita said. 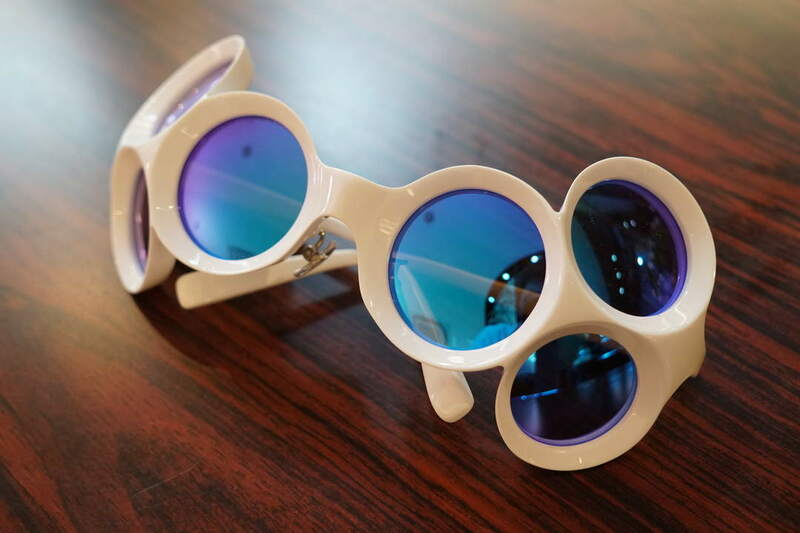 However, the shop seems to be walking its own independent path, and he said “Recently, more customers are seeking outrageous products.” He laughs, saying “Now, I’m looking for only unusual glasses,” at a trade show. 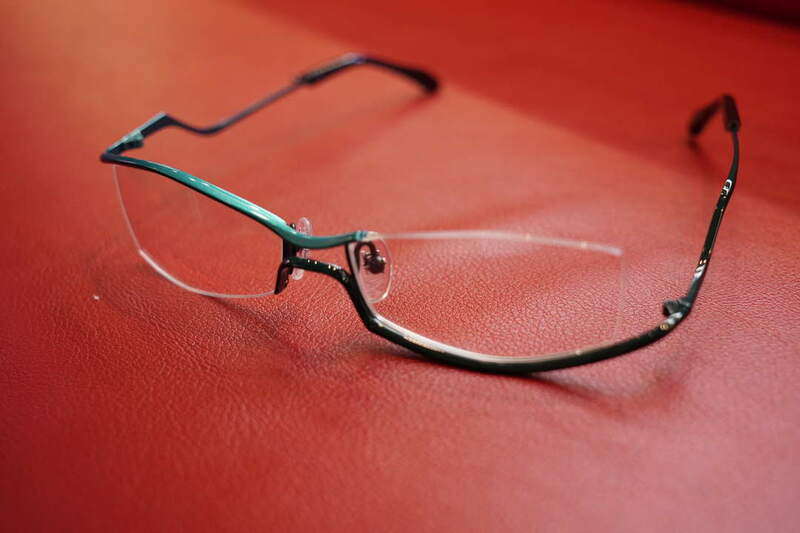 Mr. Yamashita said that he desired to offer glasses which can make people smile and excited when they put on the glasses. However, it is not limited to unusual glasses. 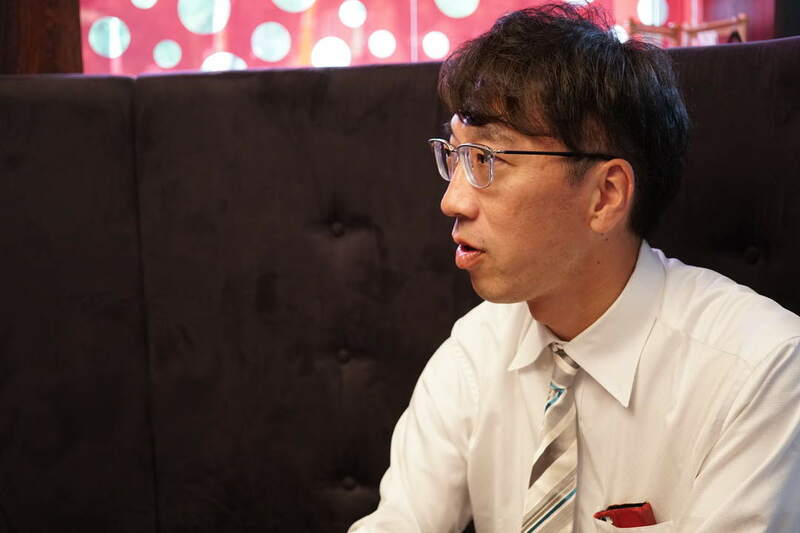 As a glasses sommelier, Mr. Yamashita selects right glasses earnestly, feeling pressure, as a professional. He must select the glasses that would look nice on you. Outdoor chessboard hidden in the square? Let’s take a brief break here. Heading to Bashamichi Street from Kannai Station, you will get to Bashamichi Square first. It is the place where there are public art “New Wind” and a gas light that came from Trafalgar Square in U.K. 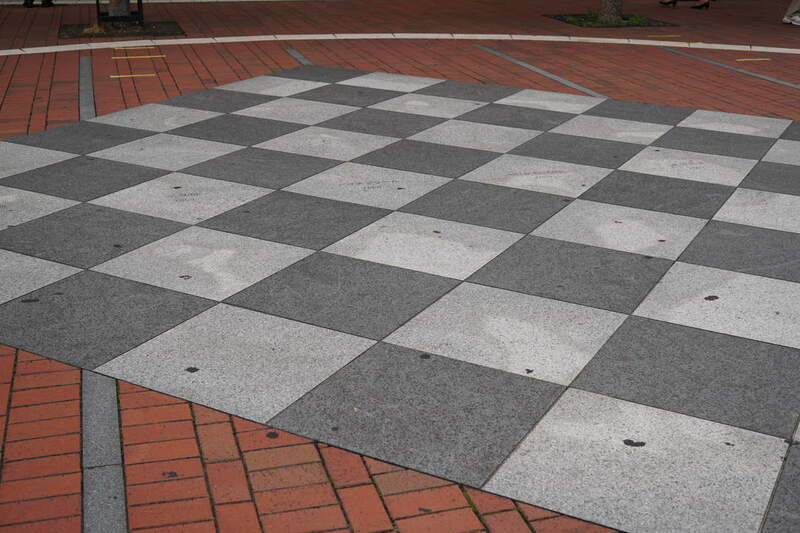 There is a checkered stone pavement in this square. On white parts of the patterns, “the first things in Japan” have been etched with years, for example, “Ice Cream 1869” and “Gas Light 1872”. They conveys a part of the history since the opening of the port. In addition, as these checkered stones can be used as a chessboard, the outdoor chess tournaments have been held many times. The chessboard is so big that the chess pieces are also big. Allegedly, people lift them up and down while enjoying playing games. “Art Jewelry“ was born in 1946 in the name of “Art Shokai”. 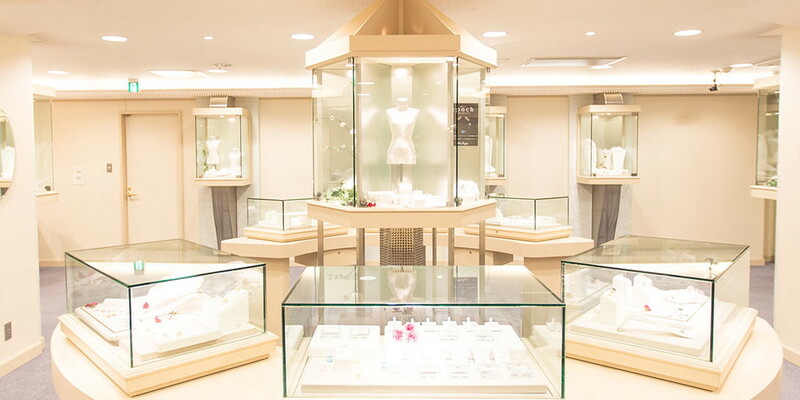 Since then, it has made efforts for contributing to the development of Bashamichi Shopping Avenue as a community-based jewelry shop, as well as a leader of the local community. 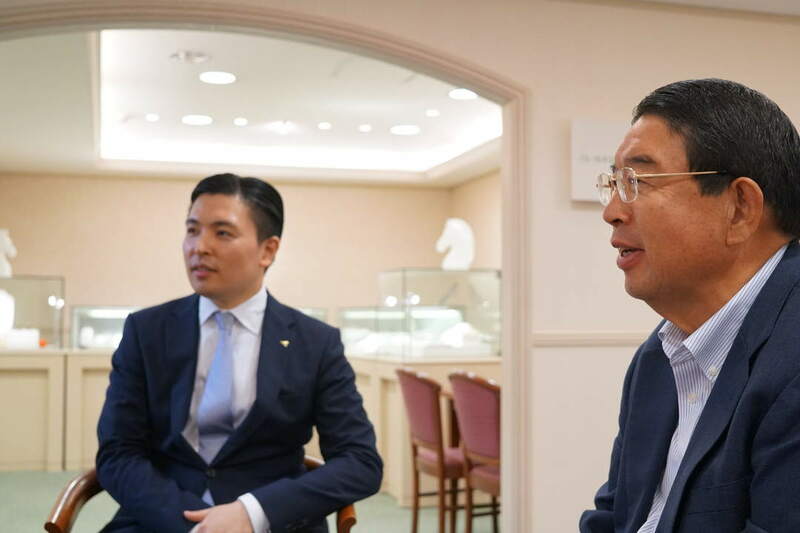 The previous president took initiative in the formulation of “Bashamichi Development Agreement”, and the present president, Mr. Katsuhito Rokukawa (right in photo below) is also active as a chairman of the Bashamichi Shopping Area’s Board. Art Jewelry that loves the home town “Bashamichi” so much sells a jewelry collection named “Bashamichi Collection”. 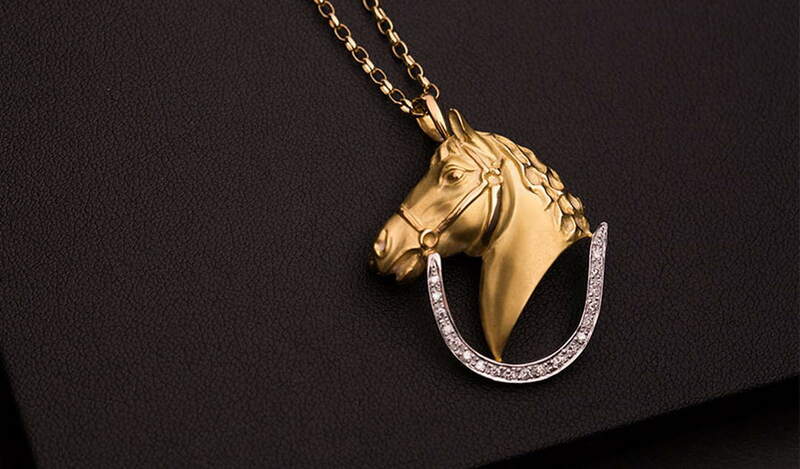 The collection of jewelry with design fit for Bashamichi (Horse-drawn Carriage Street) is very popular, including a series using the horse that used to go up and down the street, a series of Western ladies, and a series of a gas light that is a symbol of the civilization and enlightenment. At the beginning, however, the situation was slightly different. The Bashamichi Collection was made in 1974. It started by collecting rare jewels and other items that the shop had, and naming them “Bashamichi Collection”. In other words, it was not necessarily designed while conscious about the Bashamichi Street. In the wake of YOKOHAMA EXOTIC SHOWCASE in 1989, the collection is said to become the present lineup. 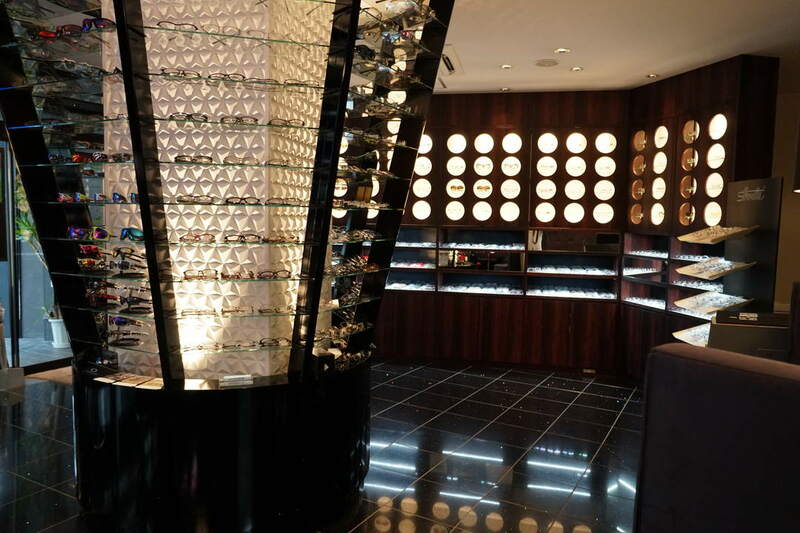 When the shop participated in the YOKOHAMA EXOTIC SHOWCASE as “The Bashamichi Collection House”, an original of the present collection was made by collecting reasonable jewels. 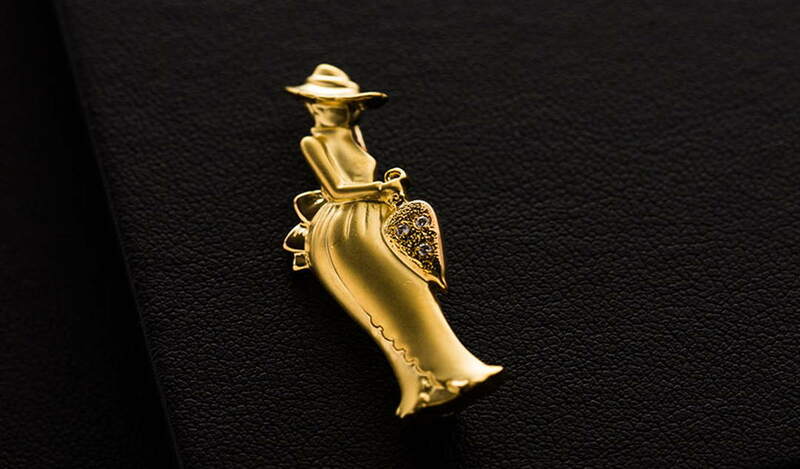 Jewelry that remains incorruptible forever has stories and culture, for example, being handed down from mother to daughter, or being presented at the time of making a marriage proposal. 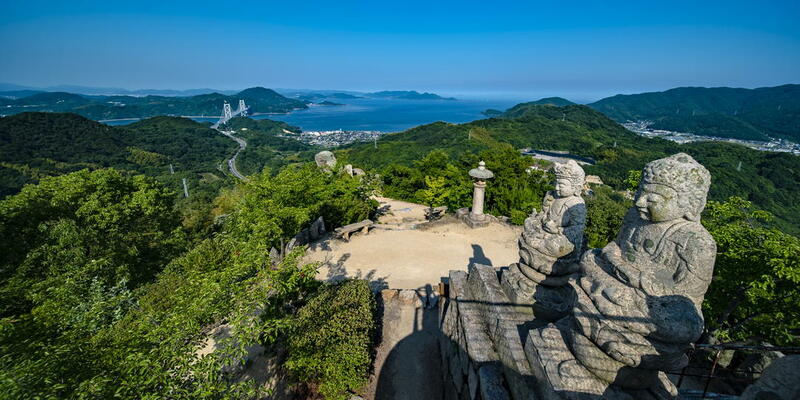 “The Bashamichi district is a site of the civilization and enlightenment, and has carefully kept the culture that was born there,” said Mr. Rokukawa, seeing it in jewelry handed down with a lot of memories. The Bashamichi Collection may represent such thoughts. 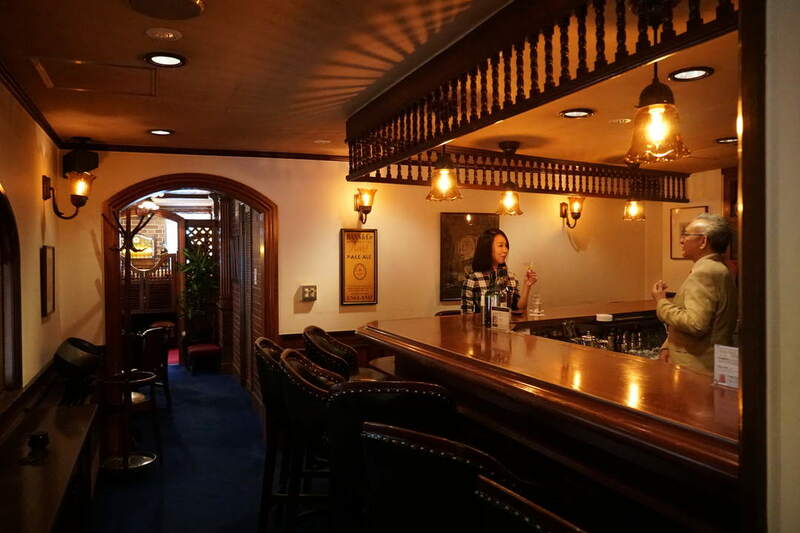 A great bar that only connoisseurs know Have a toast with a fancy cocktail at “Bashamichi Jyuban-Kan English Pub”. 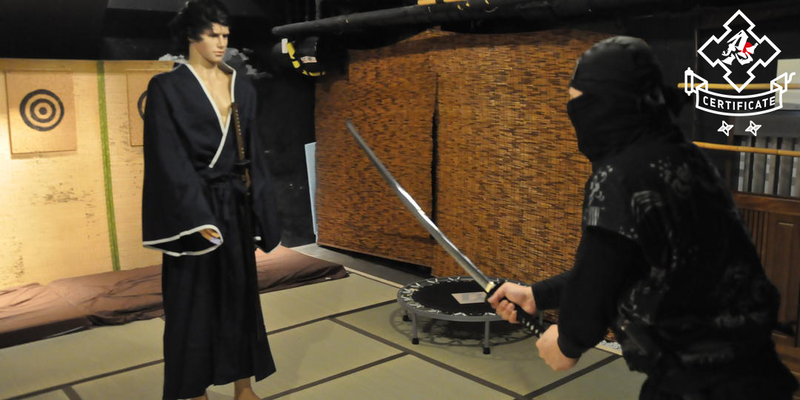 At last, we are introducing “Bashamichi Jyuban-Kan”. Jyuban-Kan is well known as a restaurant representative of the Bashamichi district. Now, we are introducing a bar on the 2nd floor. 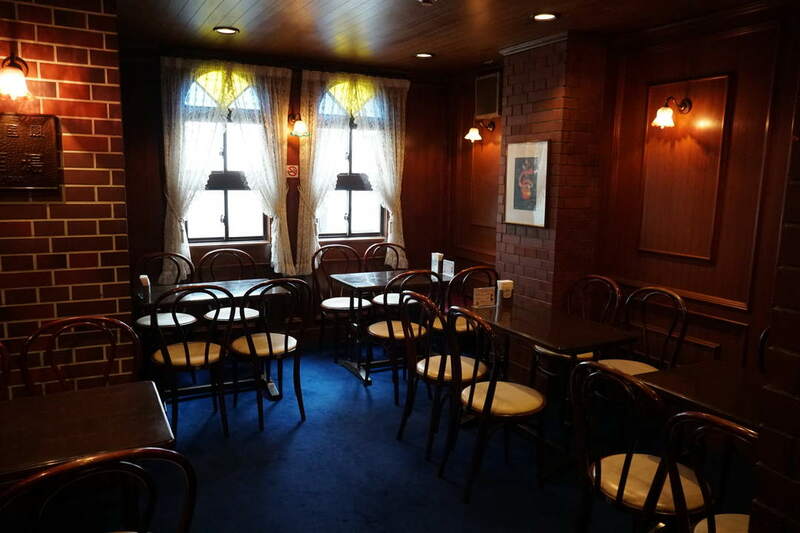 Although the bar has continued to operate since its opening in 1970, not so many people might know the existence of the bar in Bashamichi Jyuban-Kan. As the elevator does not stop on the second floor, there seems to be some customers who have not realized it even if they have visited to Jyuban-Kan. The piano placed at the entrance, which was produced by Nippon Gakki Seizo Kabushiki Kaisha that is the predecessor of YAMAHA, welcomes customers. In the bar, there are a L-shaped counter and individual tables which allow you to spend relaxed time. 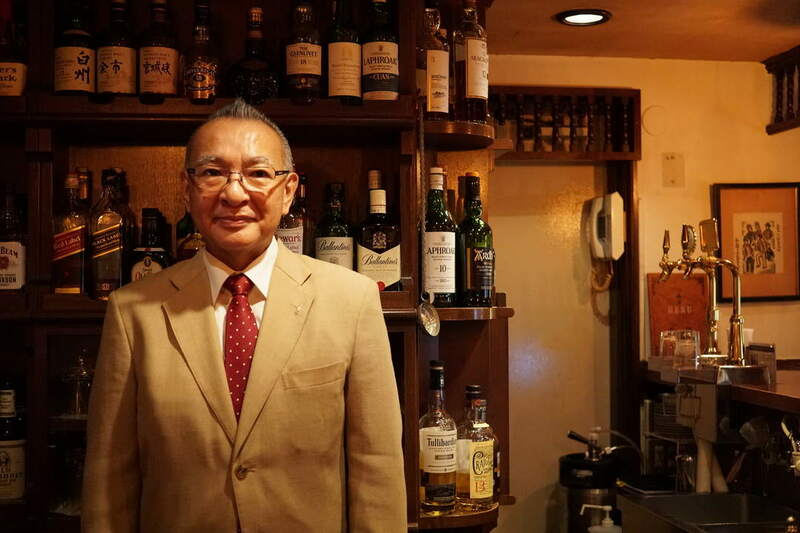 Mr. Yukio Asaba, a general manager of the Jyuban-Kan, has served as a bartender over 30 years, including 10-year experience at this bar. Even now, he seems to shake a cocktail shaker behind the counter on Sunday. The regulars love this bar like a hideaway where they can settle down to drink. You can order cake from the cafe on the first floor and menus from the restaurant on the third floor. The bar is also confident in taste of traditional cocktails. Despite its history for about 50 years, the bar is known only by connoisseurs of the Bashamichi district. It is cool to have a cocktail at such a bar, isn’t it. 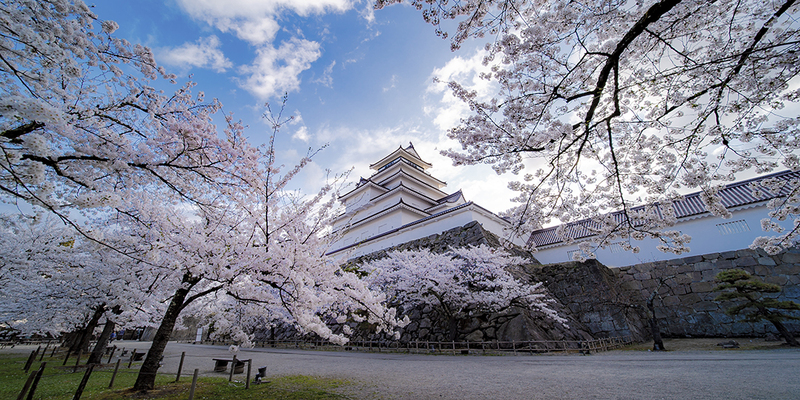 Let’s explore “Historical Episodes” of the Bashamichi district. As the Bashamichi district has the history about 150 years, the shops in the district have respectively histories. The shops you frequently visit may have a secret story, or the shops you unconsciously pass by may have a mystery. The Bashamichi district is such an area. 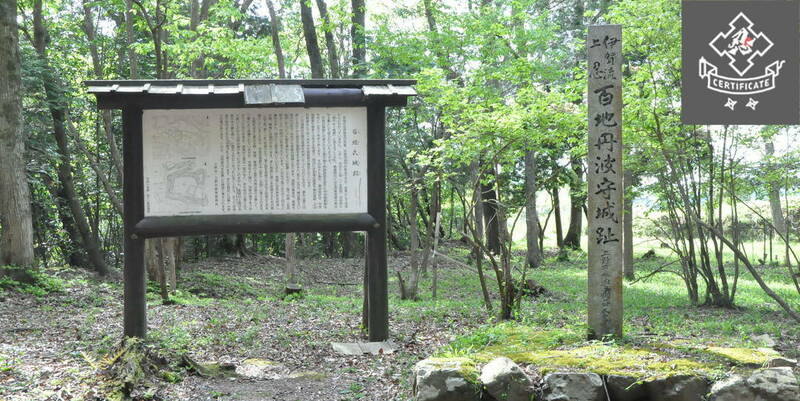 In addition to places introduced above, why don’t you explore “historical episodes” of the Bashamichi district while taking a walk and talking to local people?